Lexmark Prospect Pro205 Ink Appealing Deal! Andrew Lu November 23, 2010 November 23, 2010 1 Comment on Lexmark Prospect Pro205 Ink Appealing Deal! Lexmark Prospect Pro 205 ink and printer are on sale now! If you are looking forward to an all-in-one printer at a decent price and costs you less on consumables, this Lexmark Pro205 might be you ideal choice. The printer is on sale now for $99.86 at Staples.ca, with $80 instant saving. 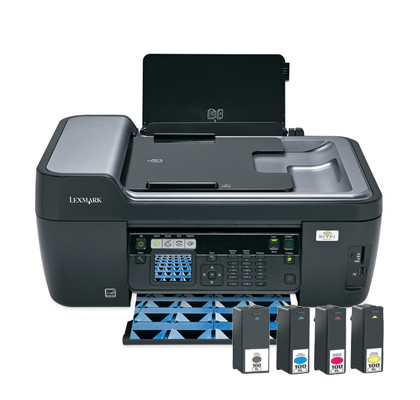 And you could cut off your budget even more with compatible ink for Lexmark Pro205. The Lexmark Prospect Pro205 All-in-one printer is not only an excellent printer for home users, but also well-suited for business purpose. It allows you to scan, fax, and print conveniently, and the results are as good as laser printer outputs. Besides, with Wi-Fi connectivity, you could do your printing where you want, not where the cord is. Another impressive feature of this entry-level printer is the paper feed and 2-sided printing. With a maximum capacity of 100 sheets of plain paper, you could easily complete a tough printing job. Get significant savings on printing, count on 123ink.ca. We endeavor to announce the hottest deals of printer and we provide the best and cheapest ink and toner cartridges. Shopping with us, and you could save more than you think. Is this Lexmark Prospect Pro 205 listed at Staples brand new for $99.86 and can it be delivered?